Welcome to our Alaska Achievers Blog hop for May! It’s now only 45 days until Wade and I leave for our incredible adventure. We’re leaving 3 weeks prior the cruise, to travel around the USA and Canada beforehand to make the most of our trip! 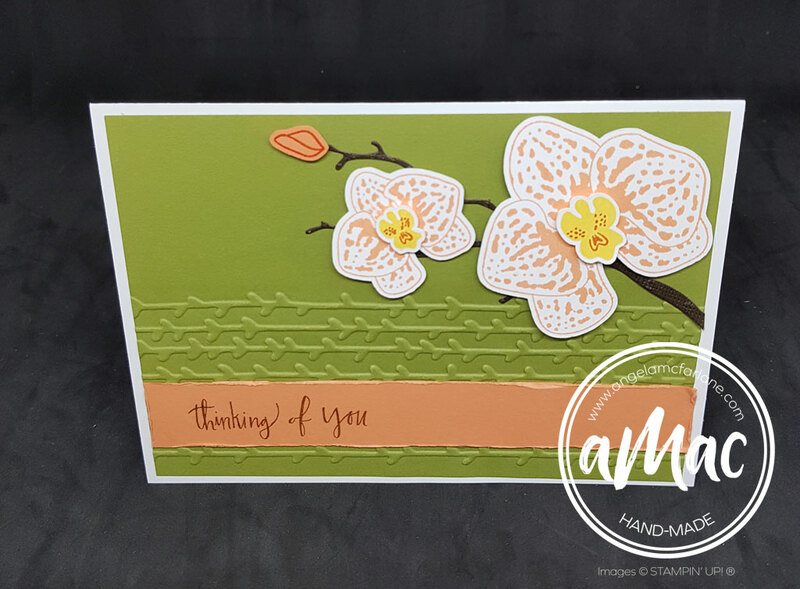 This month we are highlighting the Stampin’ Up! ‘Share What You Love Bundles’. 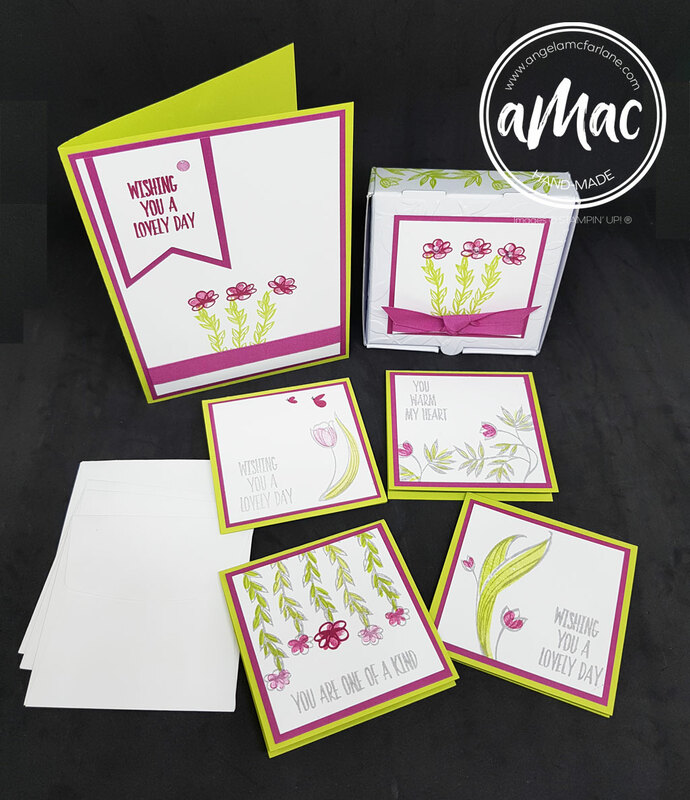 I also used the ‘Love What You Do’ stamp set for the greeting. 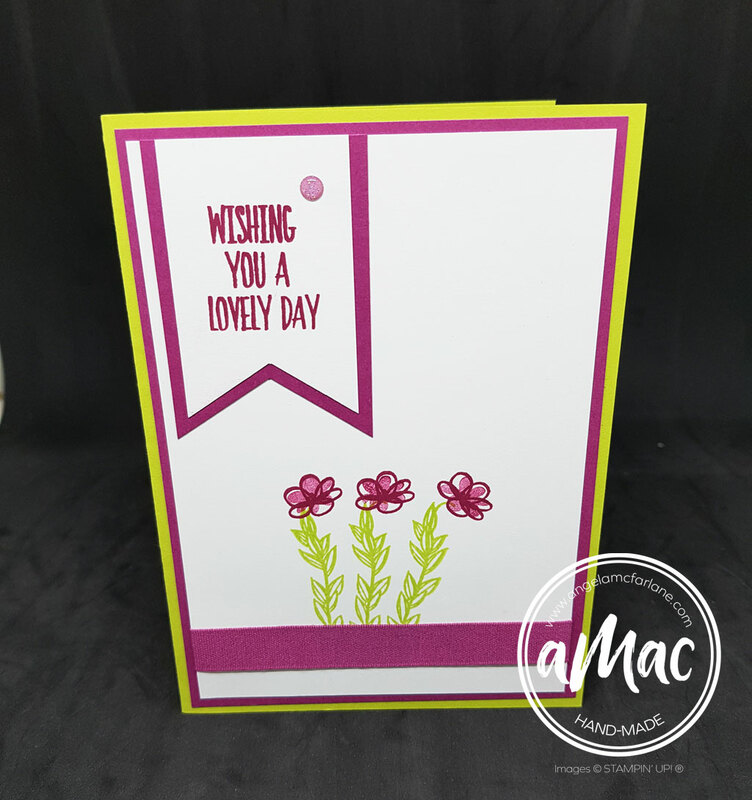 The little floral embellishments are stamps in this set which I fussy cut and added rhinestones coloured with Stampin’ Blends. I am also loving the new ‘Stitched Labels Framelits’ which will be in the new catalogue. Have you had a chance to check out the Gotta Have It all Bundle? This is available for YOU to pre-order before the new catalogue is released!!! It’s a fantastic bundle of loveliness that costs $222.75 BUT you don’t have to pay that much!!! 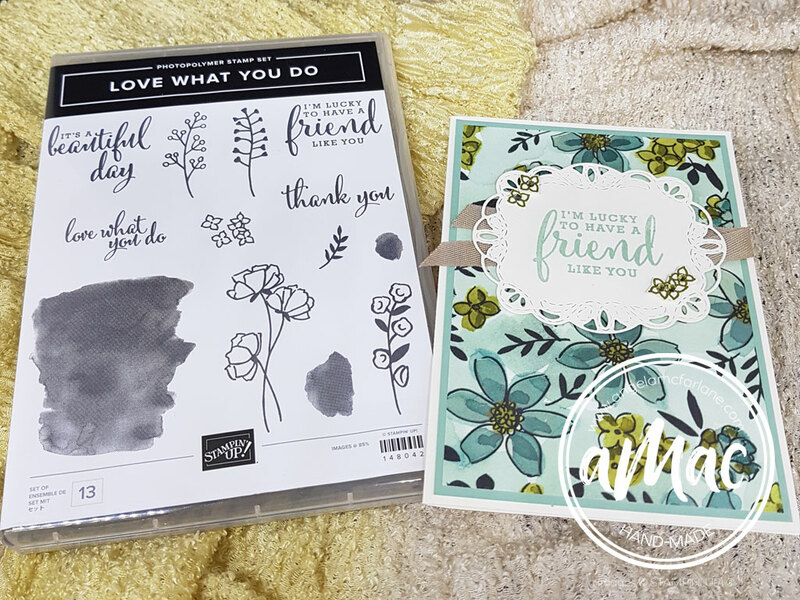 If you want to join my Stampin’ Up! team, you will ONLY pay $169 for this gorgeous bundle and get $235 worth of product! So…this means that you could get this bundle at a huge discount! You could JOIN and pay just $169 and receive the ‘Gotta Have It All Bundle’ PLUS get the extra three freebees with it and have $12.25 left for another little goodie. The wonderful offer doesn’t end here… PLUS you will get 20% off your future purchases at least until the end of October! Are you excited as I am??? If you’re wanting to join up and take advantage of this amazing offer give me a call on 0403 305 785, email me join online by clicking on the button below. Thanks for visiting my blog me today. 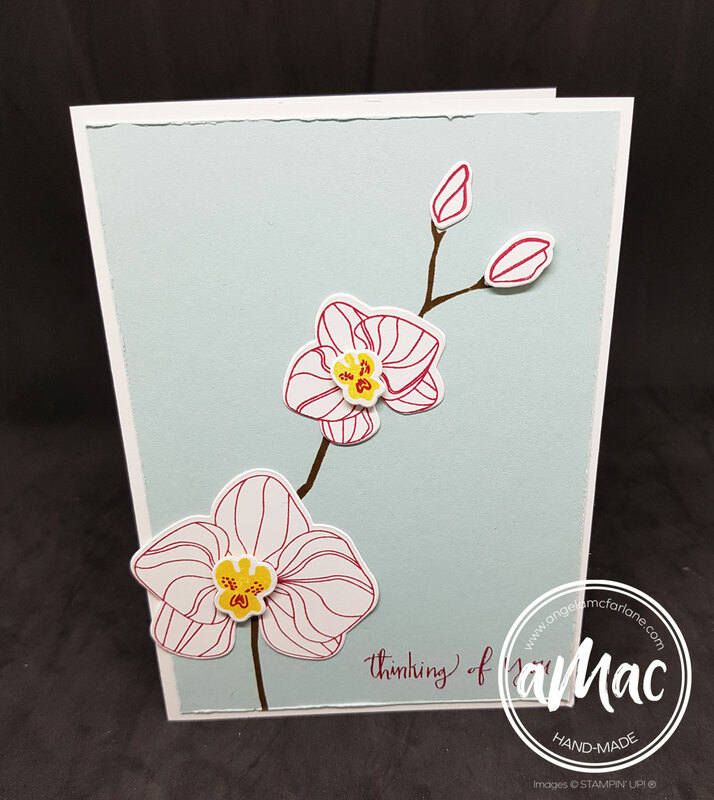 You’re currently on my blog aMac by Angela McFarlane and further down this post you will see a list of everyone that’s taking part. Check the list below to see who is up next. Make sure you visit everyone so you don’t miss out on amazing inspiration and creativity. 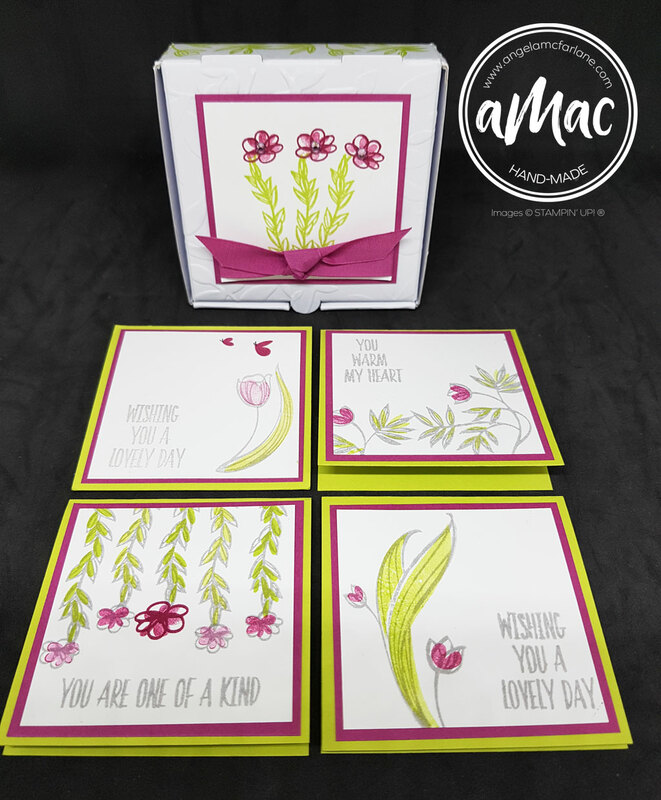 A little birdie told me that this gorgeous bundle is carrying over into the new annual catalogue! While the stamp set and coordinating dies are continuing, the paper, unfortunately, is not. 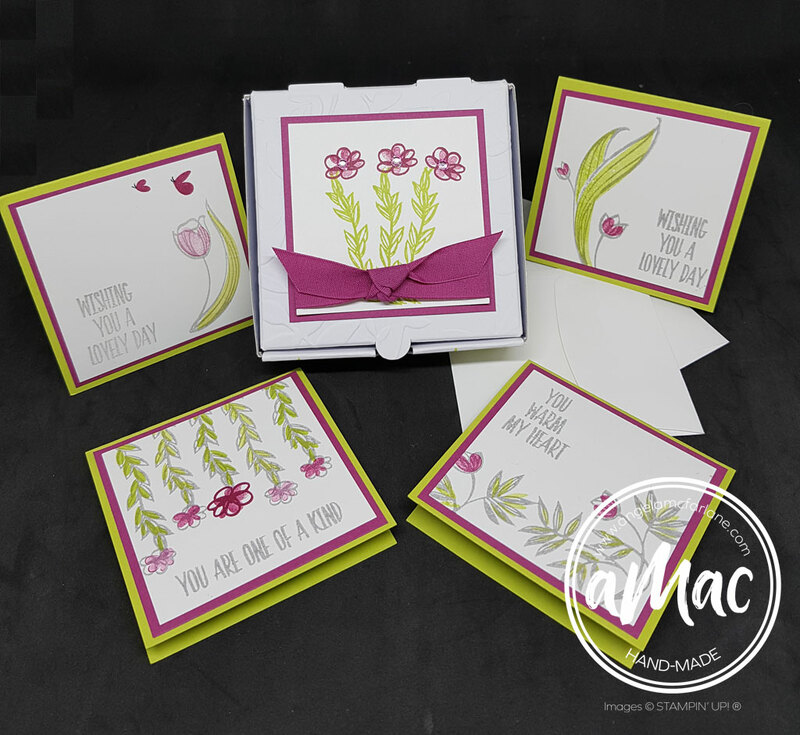 So before it’s too late, Stampin’ Up! 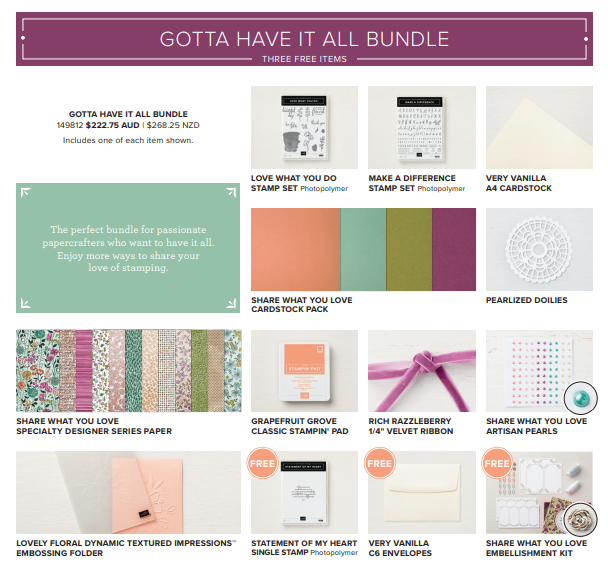 wanted to feature this bundle with its divine paper. 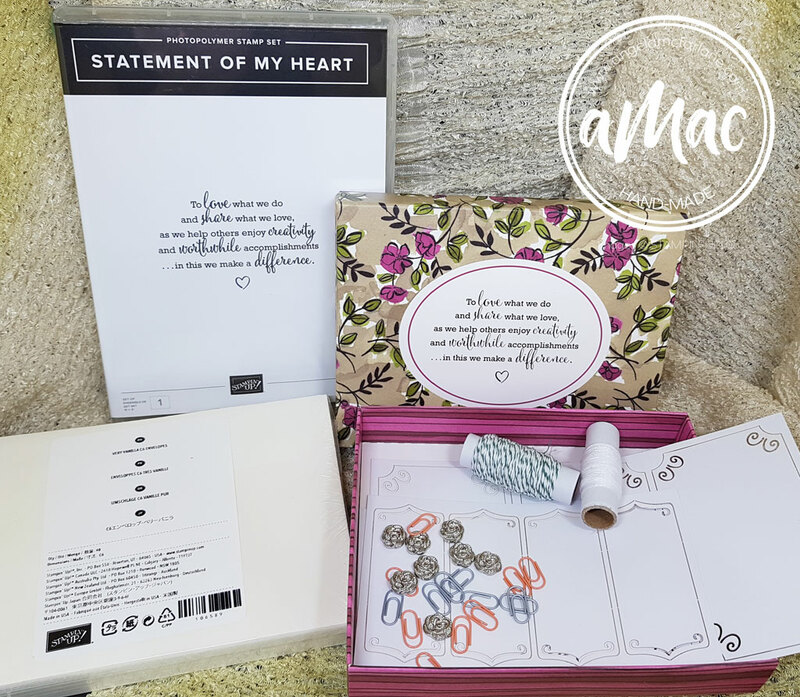 This bundle can work for any occasion, but it’s the perfect time of year to use it to create beautiful sentiments for the women in your life for Mother’s Day. Welcome to our Alaska Achievers Blog hop for April. 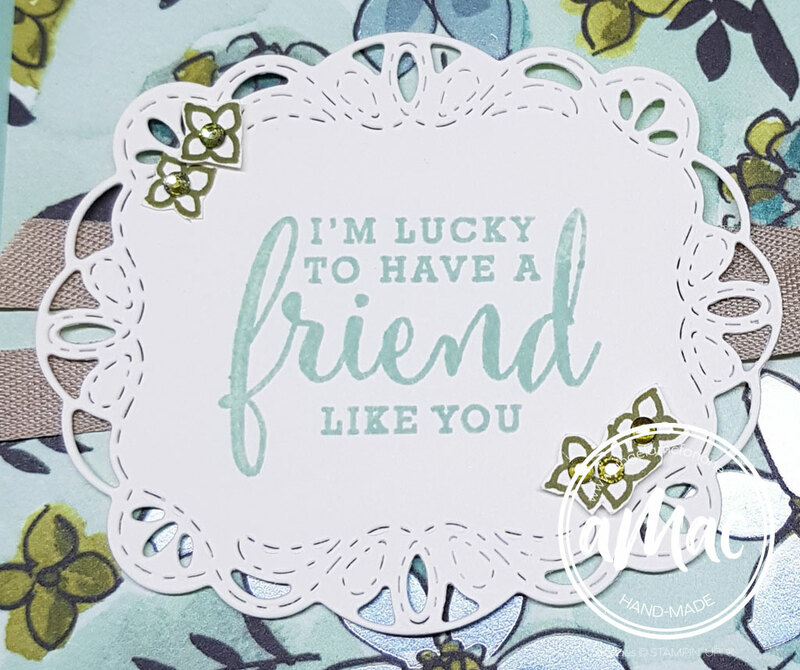 This is my second Blog Hop which I have the privilege of taking part in. Demonstrators from all around the globe have earned the incredible Stampin’ Up!® incentive cruise to Alaska this year including myself! It’s now less than 2.5 months until my husband Wade and I leave for this incredible experience. You will be inspired by all these amazing, creative people. 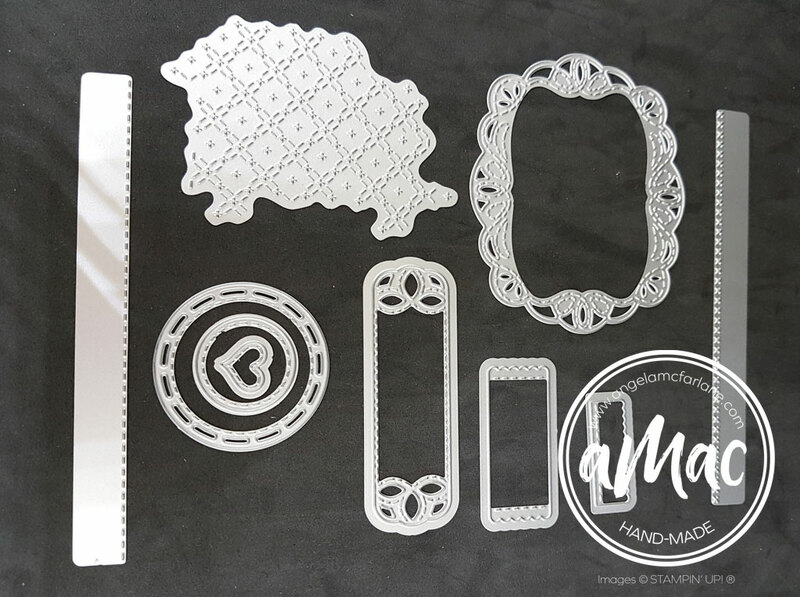 This month we are sharing some Ideas from Stampin’ Up!® Onstage events that we attended. I went to Luna Park in Sydney. Here is a sneak peek of things to come from the new catalogue that is launched on 1 June. If you’d like a copy of the catalogue, please email me. 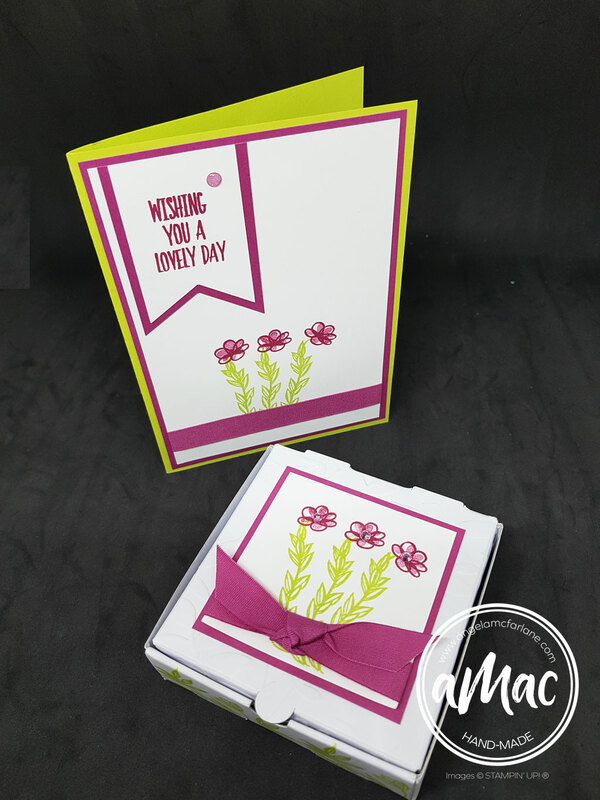 I have made two cards using bonus products that we received in our spoils at OnStage. 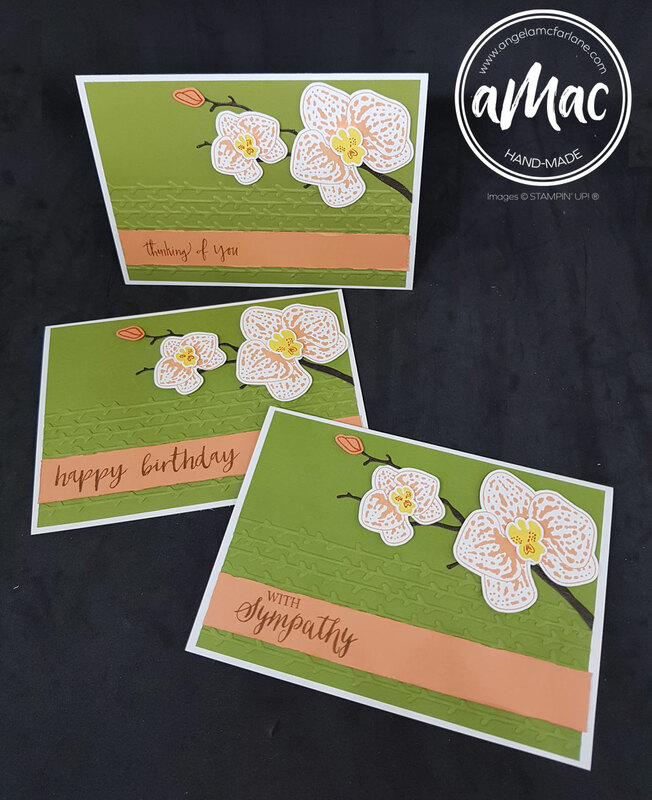 Both are made using beautiful new note cards and envelopes as well as the gorgeous new Delightfully Detailed laser cut DSP which is very vanilla on one side and whisper white on the other. On my first card I used the very vanilla side. This DSP is SO beautiful that I let it shine. 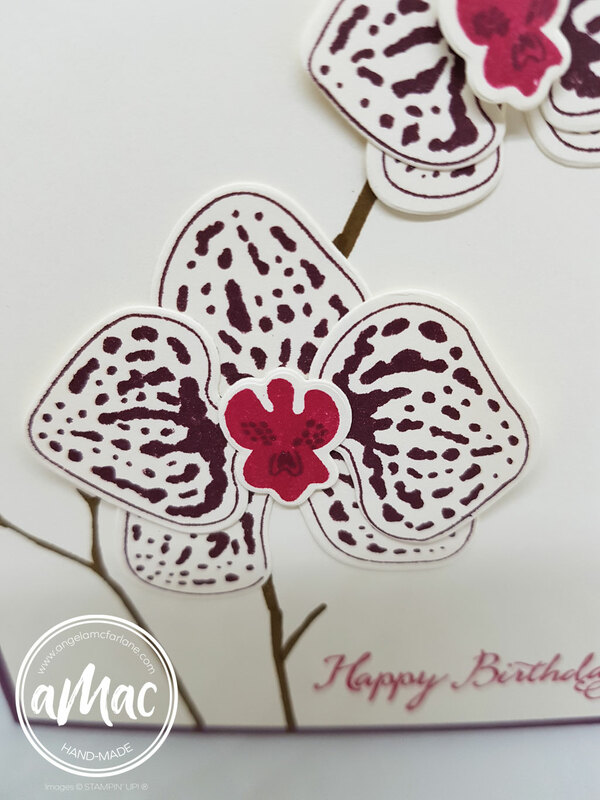 I just used minimal greetings and embellishments to finish the card off. The new Rich Razzleberry velvet ribbon is stunning. 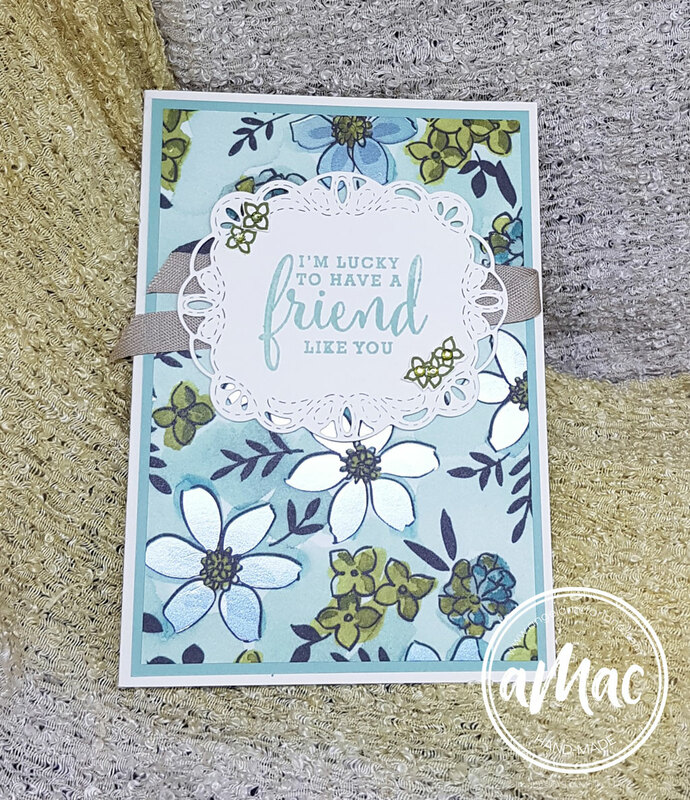 I coloured the rhinestones with matching Stampin’ Blends. 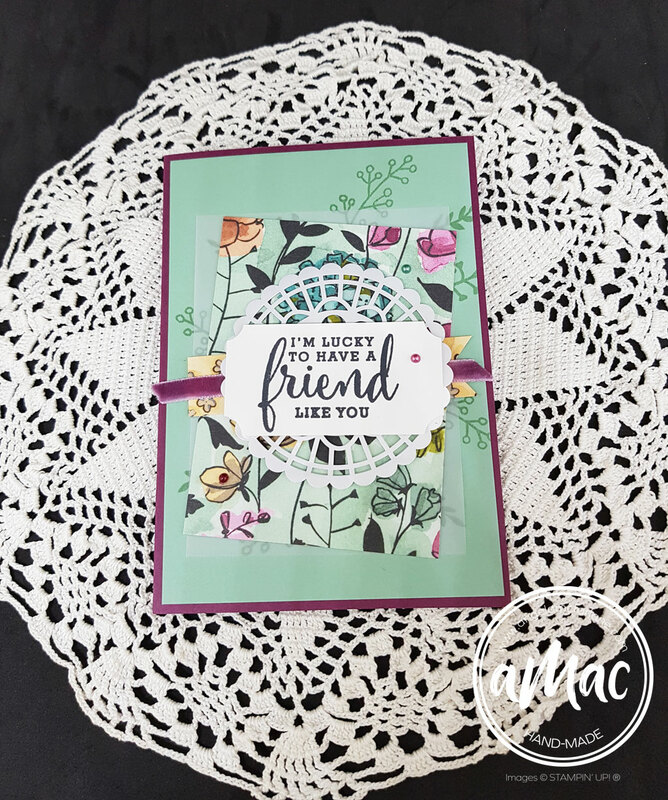 To finish the card off, I added an insert and stamped it with the matching Oh So Eclectic stamp set and I also stamped the envelope to complete the set. 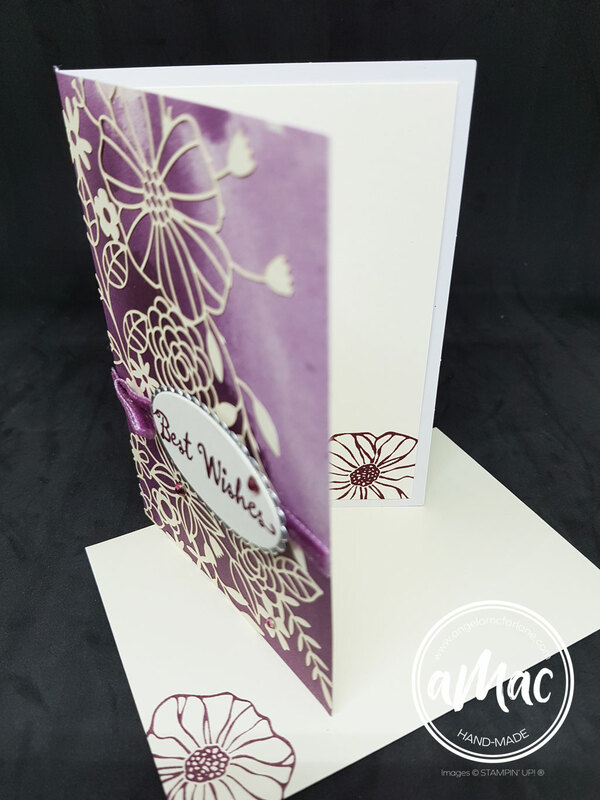 With the second card, I used the reverse whisper white side of the laser cut DSP. Once again, I kept it simple with another new cute new polka dot ribbon. 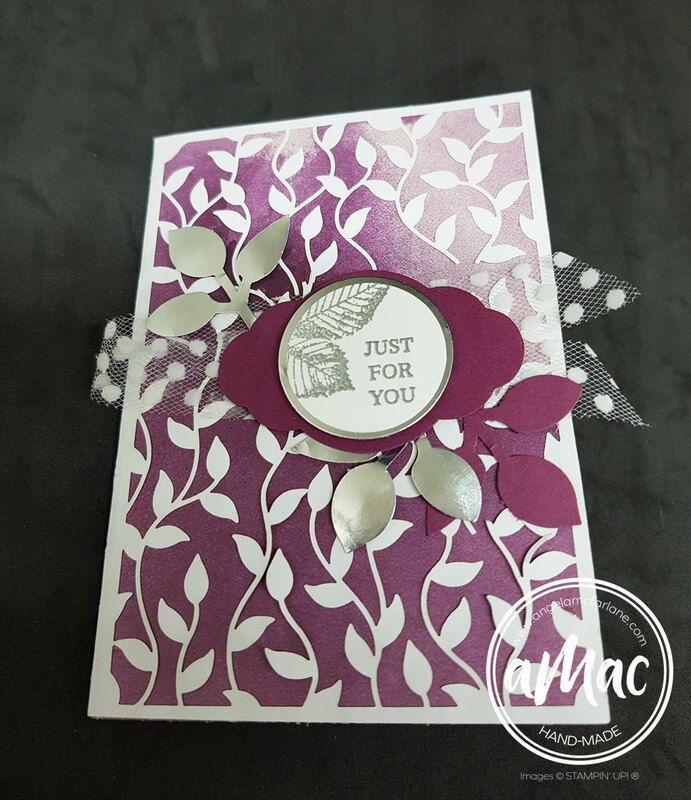 For the leaves in silver and Rich Razzleberry, I used the leaf punch. 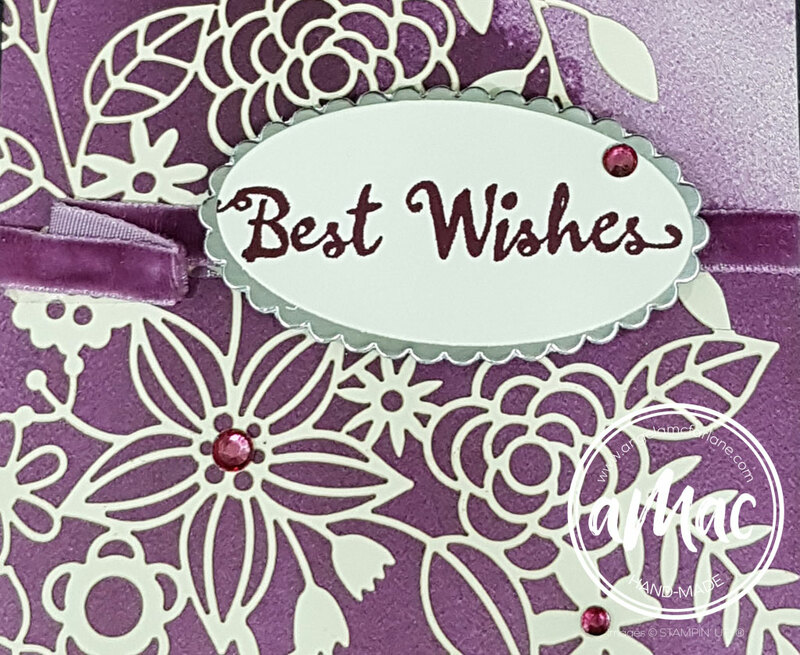 I embossed the greeting in silver and added a stamped/embossed embellishment tying the leaf theme together. 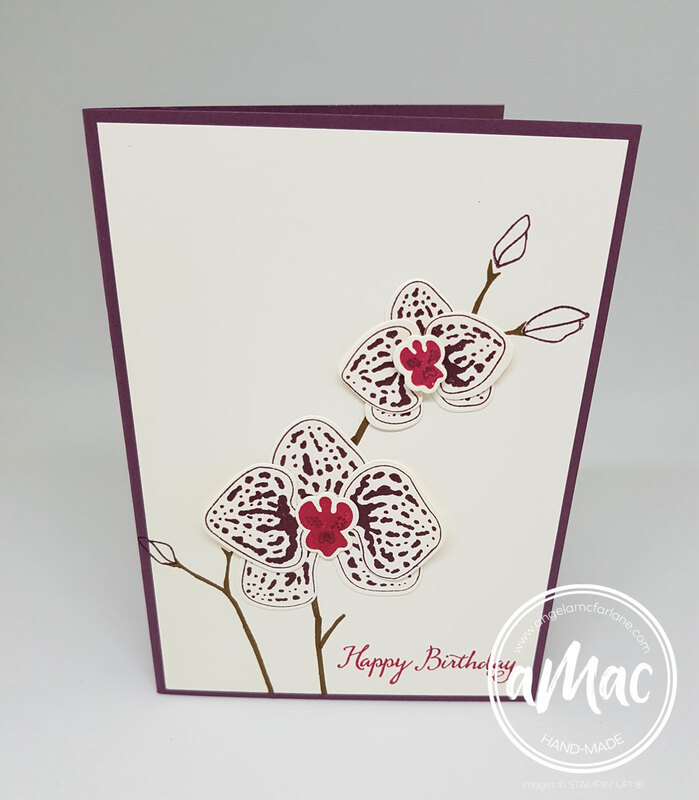 Once again, to finish off the card, I stamped the insert and envelope to match. 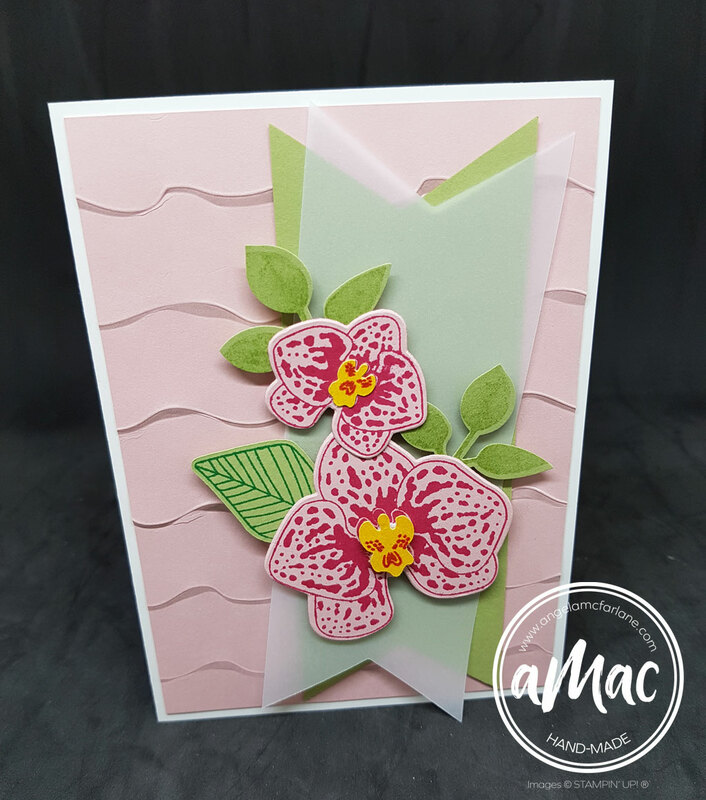 This last card isn’t my design, it was one of my favourite make and takes at OnStage. I just added an additional Rich Razzleberry layer as the base to create a little extra contrast. How pretty is the DSP on this one?! I can’t share a carousel today, you’ll need to stay tuned for the NEW catalogue coming 1 June! OnStage is so much fun! I had an amazing time with my team as well as lots of other demonstrators. 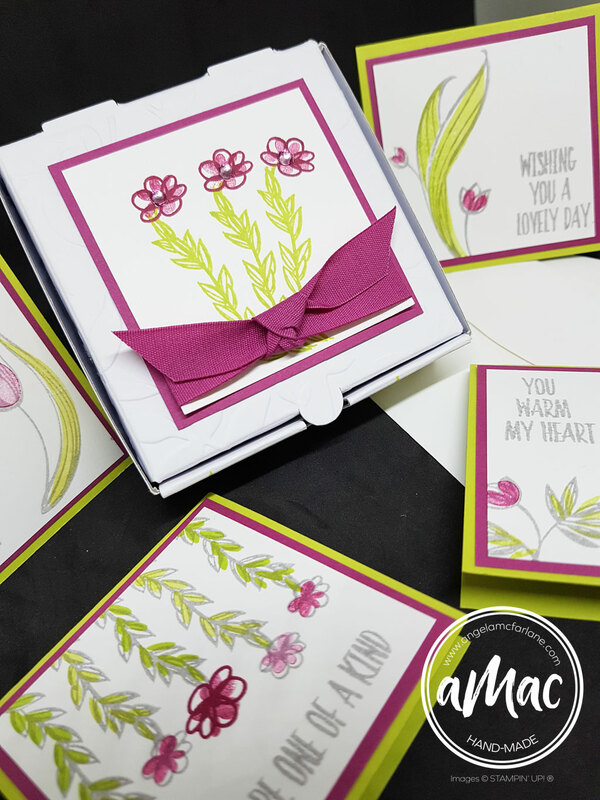 We have the privilege of learning new things, have an amazing time crafting and get our hands on the new coming catalogue. If you want to join in on the fun, please join my team. Thanks for visiting my blog today. 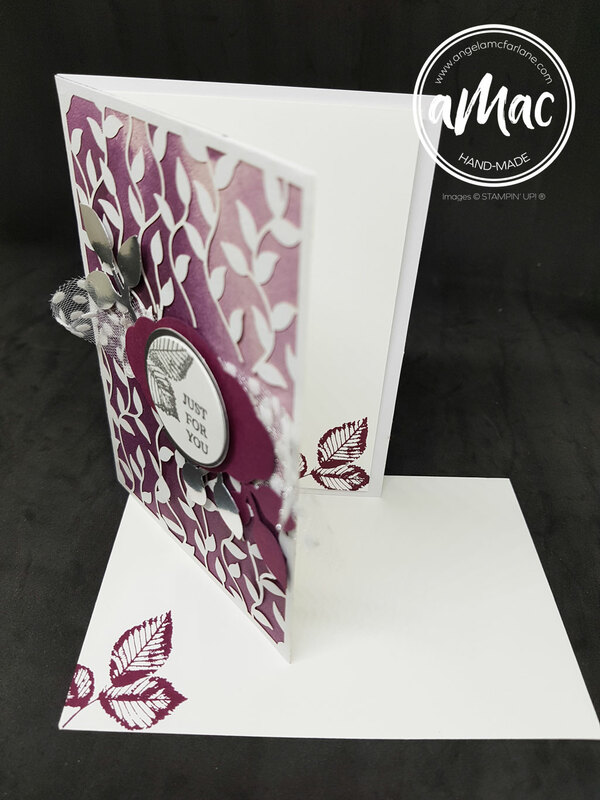 You’re currently on my blog aMac by Angela McFarlane and further down this post you will see a list of everyone that’s taking part. Check the list below to see who is up next. Make sure you visit everyone so you don’t miss out on some amazing inspiration and creativity. It’s time for a few changes. You may have noticed a few little changes on my website lately. This is to freshen it up and to make it more user friendly. A big thanks to my wonderful hubby Wade, who takes care of all of the ‘techie’ stuff and manages my website. Hasn’t he done a wonderful job!? 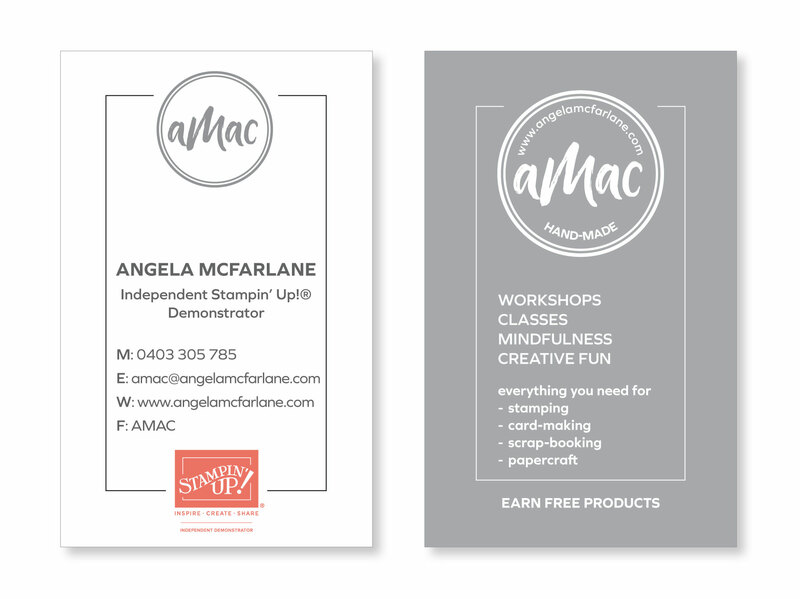 I am so excited to introduce my new aMac brand logo! I’ve also had some new business cards made which are very different to my old ones. I’ve kept the style very simple. Do you like them? 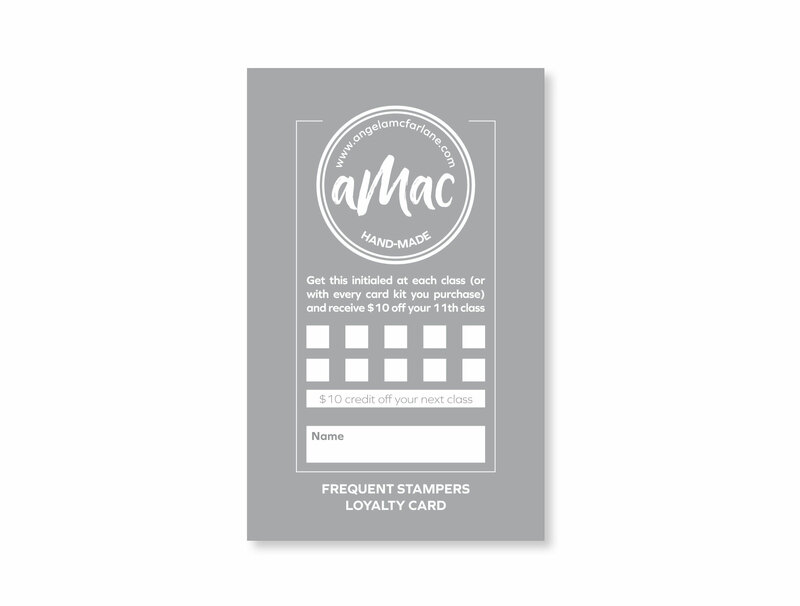 And last but not least… I have introduced a Frequent Stampers Loyalty Card! This is a ‘thank you’ from me to reward my loyal customers who come to my classes on a regular basis. I really appreciate your continued support. You will receive this loyalty card form me and I will initial it for each class that you attend. This will also be valid for class kits purchased, if you’re not able to attend a class. Attend 10 classes and you’ll receive a $10 discount off your 11th class, it’s that simple! Since I was a bit slow off the mark and didn’t have it ready for the beginning of the year, I will backdate it for each attendee. I hope you like the changes and thanks for your loyalty and support. Welcome to our Alaska Achievers Blog hop for March! I am brand new to Blog Hopping! I’m humbled to be a part of this amazing Blog Hop. 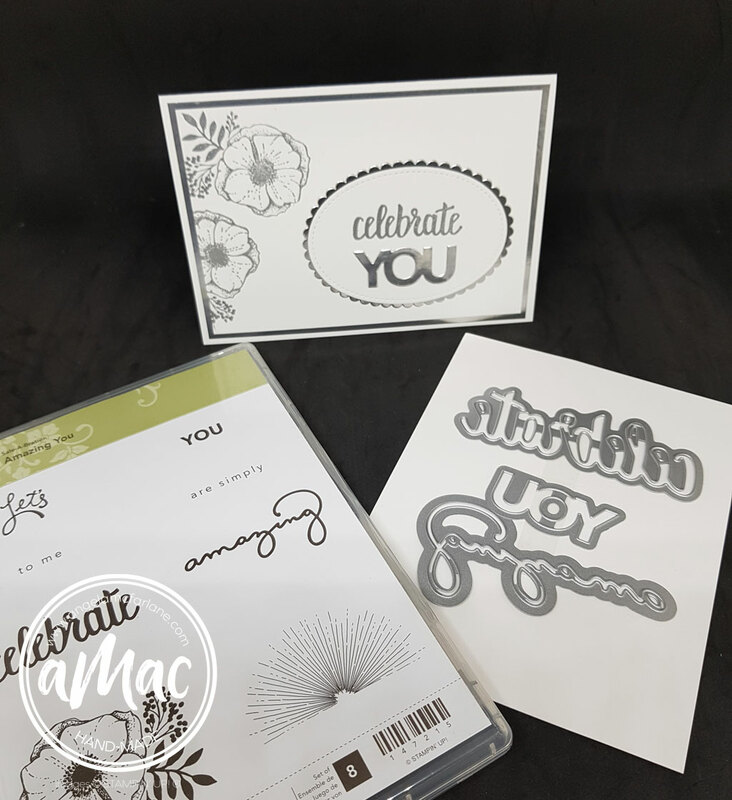 Demonstrators from all around the globe have earned the incredible Stampin’ Up!® Incentive Cruise for two to Alaska this year including myself! Along with my husband, I’m sooo excited to be going on this trip in less than four months’ time! Once again, thanks to my amazing team and customers who helped me to achieve earning this special incentive trip. You will be inspired by all these clever and creative people. 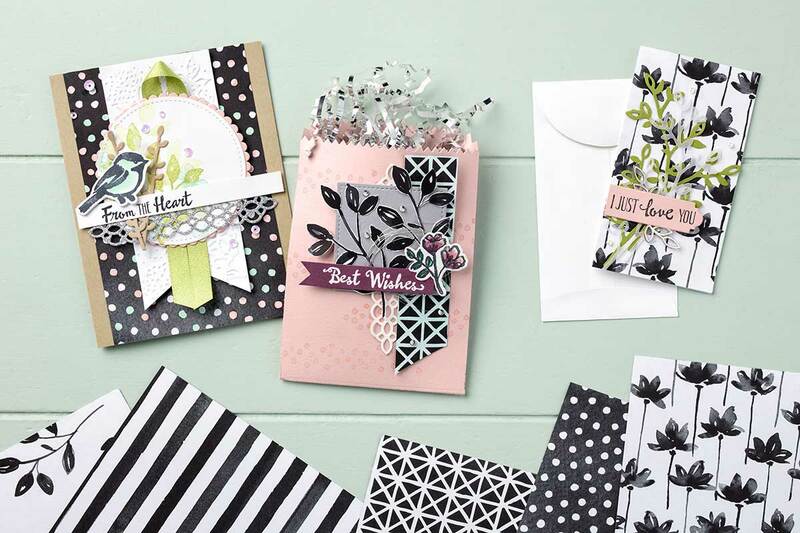 This month we are sharing some ideas using products from the Sale-a-Bration catalogue. Sale-a-bration this year is awesome! I am loving the two levels of free items. Today’s card uses two different Sale-A-Bration products. 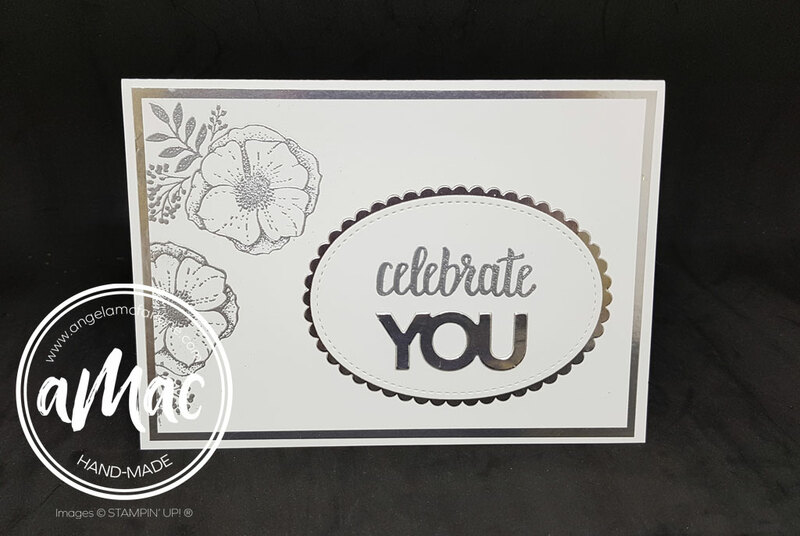 The Amazing You stamp set which is a ‘Level 1 freebie’ and the Celebrate You thinlits are a ‘Level 2 freebie’. The two combined are amazing! There’s only one week of Sale-A-Bration left. If you shop in my online store you may earn these freebies. Please use host code Q9VMYKMB and I will send you an extra little thank you surprise. 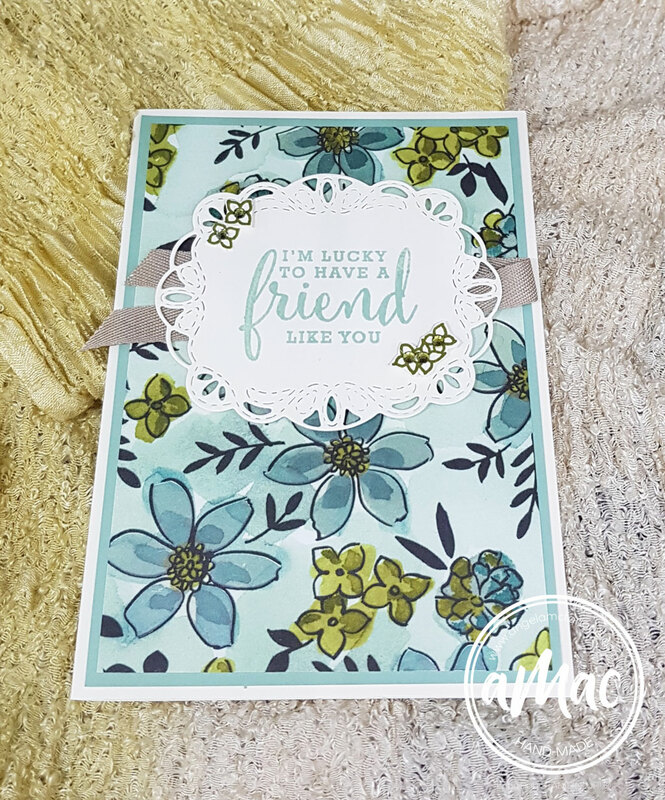 I made this special card to celebrate an adopted team member who promoted to Silver status last month. 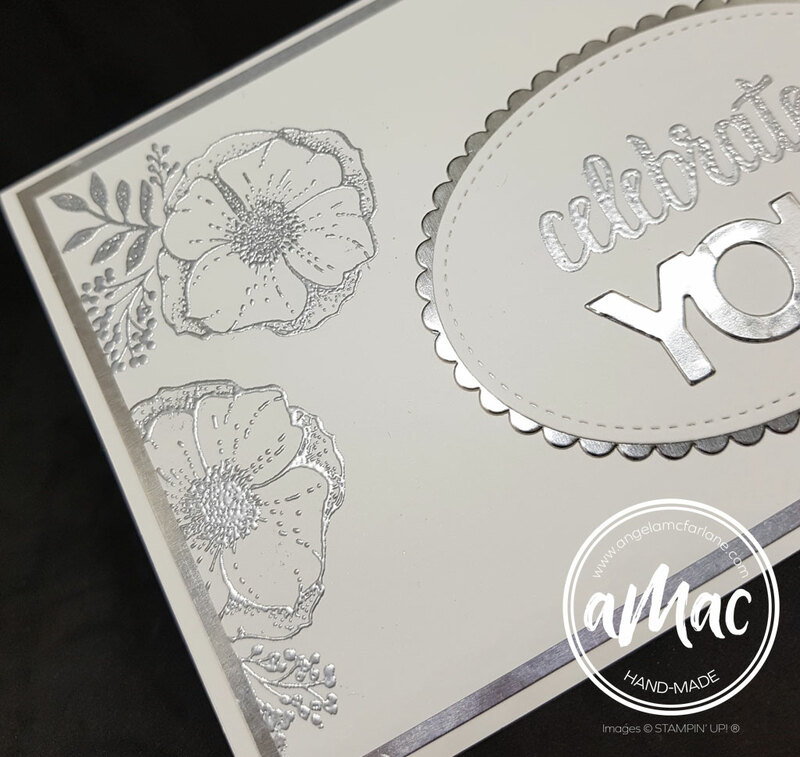 I used silver embossing for the flowers and the celebrate greeting and used the thinlits for the YOU. 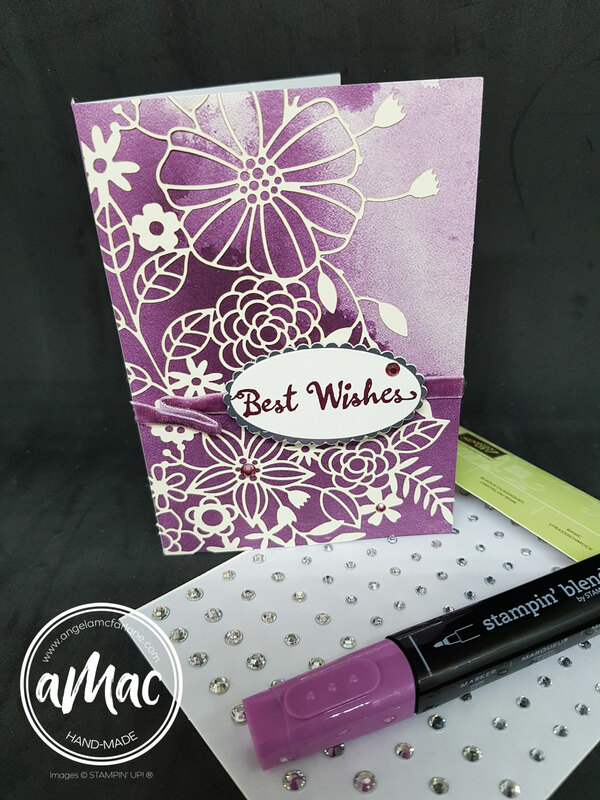 The silver foil is always great to add an extra bit of bling without going overboard. Thanks for joining us today. 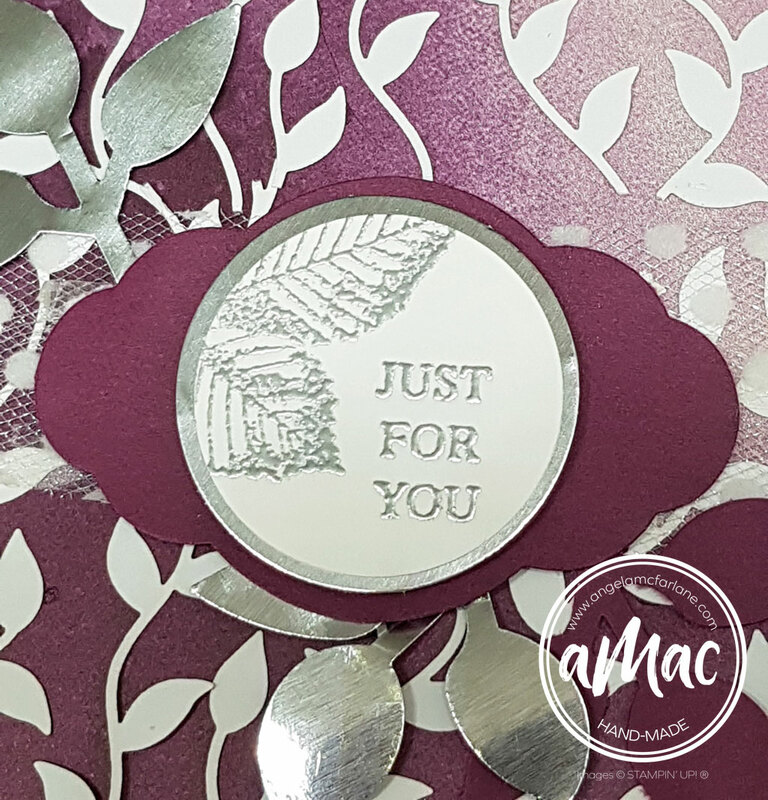 You’re currently on my blog aMac by Angela McFarlane and further down this post you will see a list of everyone that’s taking part. Check the list below to see who is up next. Make sure you visit everyone so you don’t miss out on some amazing inspiration and creativity.